What Causes Pain in Toenail? There are several primary causes of pain in toenail, including poorly fitting footwear, ingrown toenails, fungal infection and injuries. The good news is that each of these issues can usually be treated through the use of proper footwear, homemade remedies and over-the-counter medications at home. However, it may be necessary, in some instances, to obtain treatment and advice from a professional healthcare worker. Improper footwear is often one of the easiest problems to correct. When the toe box of your shoes is to narrow, your feet may not have enough room, placing too much pressure on your toes. The big toe can be particularly affected. High-heeled shoes are the most frequent culprits due to the shape of these shoes. The height of the heel can also create problems. Generally speaking, higher heels, such as stilettos, increase the amount of pressure on your feet. One of the best ways to resolve this problem is to wear shoes with a low heel. If pain from improper footwear is not addressed and corrected, the pain can increase and even result in ingrown toenails. In addition, it is possible for the big toe to be pushed out of alignment. This can result in pain and swelling and a condition known as a bunion. When the problem is severe enough, surgical intervention may be necessary. 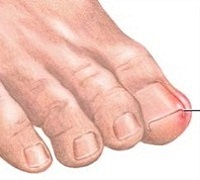 An ingrown toenail is often the result of using a rounded edge when clipping the nail located on the big toe. The nail will then become embedded into the surrounding skin. Wearing high-heels can also exacerbate this problem. Ingrown toenails can be treated by soaking your foot in a blend of warm water and Epsom salts for about 15 minutes. This will allow the skin to soften. The affected toe should then be dried gently before attempting to pry the skin away from the injured nail. Antiseptic ointment should be used to ensure the area does not become infected. It may be necessary to re-soak the affected area, as needed. This problem can be prevented in the future by cutting nails straight across rather than in a rounded fashion. Wearing shoes that fit properly can also help. If ingrown toenails are not detected and treated early, they may become so deeply embedded that surgery is necessary to correct the problem. A fungus known as Tinea Pedis can also be responsible for toenail pain. This fungus is also commonly known as athlete's foot. Symptoms of this fungus include a fungal growth that appears between the toes, thick or crumbling toenails, and pain. To treat a mild case of athlete's foot, you can soak the foot in a mixture of ¼ vinegar in water. You will need to soak the affected foot on a daily basis until all signs of the fungus have disappeared. Over-the-counter ointments may be necessary if soaking proves to be ineffective. For severe cases, it may be necessary to see a doctor a prescription-strength ointment. Several steps can be taken to prevent the risk of developing a nail fungus infection. First, avoid walking barefoot in public locations. Locker rooms are among the most common public spaces where you may be at risk for a fungal infection. It is also important to ensure that the interior of your shoes are kept dry and that you change socks daily. Socks made of 100 percent cotton are best. In addition, make sure you wear properly fitting shoes that feature a wide toe box and that do not press your toes. Finally, use antifungal or absorbent foot powder. Athletes, including walkers and runners, make notice some bruising of the toenail or even loosening of the nail from the nail bed, causing toenail pain. A common cause of this is wearing shoes that are too long. When this is the case, the individual's feet may move within the shoes, causing an injury to the tips of the toes. Shoes that are too tight can also cause this problem. Bruised nails may also be the consequence of an injury, such as dropping something on your toe or even stubbing it. When the foot is injured, it is important to keep a careful watch over the injury for at least several days. Over-the-counter medication can typically be used to relieve any associated pain. If the pain persists, it is usually a good idea to consult a healthcare professional to ensure that a more serious injury is not present. For small bruises, time will usually take care of the problem and pain will often dissipate within just a few days. For bruises that encompass a large portion of the nail, it may be necessary to seek medical evaluation. In some instances, a cut may be present beneath the nail, resulting in pressure that will need to be relieved for proper healing to occur. It is also possible for a fracture to occur in the bone located under the nail. If this is the case, a shard of bone might have resulted in a cut in the skin under the nail. To prevent infection, immediate medical attention is necessary. Anytime you experience any type of toenail pain or injury that does not improve, it is important to seek medical attention. If the pain or injury also includes evidence of an infection, you should also seek the advice of a healthcare professional. Indications of infection might include warm skin, pus, and swelling near the location. Relevant treatment may include the use of an antibiotic skin cream or oral antibiotics. What Causes Pain on the Left Arm?